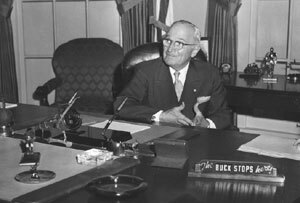 Sixty-two years ago today, Harry Truman signed the National Security Act, creating the Department of Defense, the National Security Council, the Central Intelligence Agency and the Joint Chiefs of Staff. It was an attempt to put American national security on a systematic footing, appropriate to its now dominant role in the world. There comes a point where ad hoc just doesn't cut it. Apparently, with the Falklands War looming, Thatcher called in an old experienced civil servant had a gin with him and asked, "How do you actually run a war?" The civil servant advised her on how to set up a War Cabinet and added, "It's got to have regular meetings come hell or high water." This civil servant had observed the poor management in other crises, such as 1956 when things were run in a haphazard manner, "as if it were a private laundry and not... a major country on the world stage..."
The National Security Act was intended (particularly the establishment of the National Security Council) to do just that for the United States. There is no salvation in process (Truman got into trouble several times in managing the Korean war), but it is also awfully hard to steer the ship of state without it. Also, the act placed the VP on the NSC - a matter of specific interest to yours truly - but also a recognition that orderly transitions were now essential. Several years ago, when I spent a lot more time following Palestinian politics I wrote an op-ed about the machinations of Fatah chief Farouk Kaddoumi. Since he is back in the news, in an odd little spitting match in which he accuses Mahmoud Abbas of killing Arafat (in conjunction with Israel and the U.S., of course), I thought it would be useful to re-post the piece for background. Arafat's health had been in pretty obvious decline since the late 1990s, video footage (which I watched a great deal of at MEMRI) showed he had obvious palsies and the stress of the siege and Intifada could not have been good for him. He was 75 years old when he died, so it doesn't seem that a conspiracy doesn't seem necessary to explain the demise of Abu Ammar. The current spat has led the PA to shut down al-Jazeera's West Bank office for airing Kaddoumi's accusations, in the West Bank. One of Fatah's original members, and a long-time friend of Arafat, Kaddoumi leads the Fatah hardliners and has always opposed any kind of recognition of or agreement with Israel. He has long been close to Damascus and has made many visits to Tehran. (Back in 1996 Middle East Quarterly published a fascinating biographical sketch of Kaddoumi.) Is this just a side-lined old man trying to be relevant - or is this part of a bigger plot. Here is what I wrote a couple of years ago - most of the players remain the same. While international attention focuses on Mahmoud Abbas (Abu Mazen), the maneuvers of Fatah chief Farouk Kaddoumi also bear scrutiny. With Yasser Arafat out of the picture, a Iranian-Syrian-Hizbullah axis is attempting to dominate the Palestinians, and Kaddoumi is their front man. A hardliner who opposed the peace process and remained in Tunisia, Kaddoumi calls the two-state solution a temporary stage before Israel is destroyed. He also called 9/11 "a lesson to the US." Within the PLO he was isolated during the Oslo process, but maintained close links with Syria and Iran. If the Palestinians fall into the Iranian-Syrian-Hizbullah orbit, it could condemn them to another generation of violence and have consequences throughout the region. Most of the Palestinian organizations are allied with the Iranian-led axis and, according to Israeli intelligence, Iran already directs most of the terror operations in the West Bank and Gaza. The smaller leftist Palestinian terrorist groups are headquartered in Damascus and closely linked to the Syrian regime. Palestinian Islamic Jihad is funded almost entirely by Iran and with the deterioration of Hamas's command structure, the leadership is now based in Damascus. Hizbullah operatives in Lebanon coordinate Hamas attacks. Fatah, Arafat's organization (which Kaddoumi and Abu Mazen helped found in the late 1950s), is the pre-eminent Palestinian organization and its members dominate Palestinian institutions. Various powers, Middle Eastern and beyond, have attempted to use the Palestinians for their own ends. Arafat's stature as founder and symbol of the Palestinian cause was sufficient to maintain some Palestinian independence, particularly from Syria. But no Palestinian can fill the void left by Arafat's passage. Kaddoumi is working to make sure that the Syrians, Iran, and Hizbullah fill the vacuum. In the period since Arafat's death, Kaddoumi has visited Damascus, Beirut, and most recently Teheran. In Beirut and Damascus he was greeted by large pro-Palestinian rallies and he met with smaller Palestinian factions to discuss forming a national front. In Damascus, Kaddoumi engineered a rapprochement between Syria and Fatah, including an agreement to reopen Fatah offices in Damascus that have been closed since 1985. In Teheran, he met with President Khatami, and with former and possibly future president Ali Akbar Hashemi Rafsanjani to discuss "consolidating relations between the Iranian and Palestinian nations." Kaddoumi's efforts to bring the Palestinians into the Damascus-Teheran fold extend beyond diplomacy. He has been a central player in the efforts of foreign capitals to infiltrate Fatah and other Palestinian institutions. In late 2002, a captured Palestinian agent for Hizbullah confessed to Israeli security that Hizbullah had established a network of supporters in the West Bank and Gaza to infiltrate Fatah and the PA in order to take control when the current infrastructure collapses. The agent also explained that he ultimately reported to both the Iranians and to Kaddoumi. Asked about Iranian infiltration of the Palestinian ranks, Kaddoumi told Al-Jazeera: "We welcome all the Arab and Islamic countries to come and infiltrate us." THIS IS not to say that there will be a power struggle between Abu Mazen and Kaddoumi. Kaddoumi, while personally popular among the Palestinians for his hard-line positions, could not have run for the PA presidency because he refused to move to the Palestinian Authority until it was completely "liberated." He supports Abu Mazen and paved the way for Abu Mazen's visit to Damascus. At the same time, Abu Mazen will face intense pressures from the Iran-Syria-Hizbullah axis and Kaddoumi's support could be crucial for Abu Mazen's legitimacy. There are several regional consequences if Kaddoumi's outsider allies come to dominate Palestinian politics. Syria, Iran, and Hizbullah would be in a position to continue to stoke the flames of the intifada, even as the fire is finally dying down. Moreover, the impact could well be felt beyond the Israeli-Palestinian arena. Hamas has opened offices in Iraq, and the Palestinians may be recruited to fight there. The international affiliates of the various Palestinian groups will augment the formidable Iranian-Hizbullah international terror network. Finally, Palestinian organizations have substantial influence in Jordan and could pressure or even overthrow the pro-Western Hashemites. There are many scenarios now for the Palestinians, but Kaddoumi's machinations portend a future dominated by the region's most radical elements. If he is allowed to succeed, the Palestinians will be consigned to more futile conflict and the forces of autocracy and repression will be strengthened in the region. The writer is the author of TerrorBlog (www.profilesinterror.com) and Profiles in Terror: The Guide to Middle East Terrorist Organizations. I recently helped a friend put together an op-ed. I described it as being like a sonnet - short and with a specific format - so you have to make good use of the space. I was urging him to get out of the academic mode of offering various approaches and theories. Pick a story and tell it. An op-ed is a place for focus. In some ways it reflects the divide between academics and the politicians. The academics can weigh theories and examine causes - granting that there are never simple explanations. Politicians, who are usually pretty smart, know all of that. But they have limited time and relatively blunt instruments - so they need relatively straightforward responses to the problems they face. Business types tell me that they seek a one-handed economist, because otherwise he (or she) will always say, "But on the other hand..."
Think of an op-ed as a silver bullet. With only one shot, what do you want to hit? Op-eds are about economy and focus. In a good one, everything extraneous is winnowed out and the reader takes away one thing. There is a life lesson in this somewhere. The GAO’s recent report U.S. Counternarcotics Cooperation with Venezuela Has Declined provides a nuts and bolts breakdown of how U.S. counternarcotics programs operate abroad – and how the Venezuelan government is refusing to cooperate on many of these crucial programs. Because of its strategic location next to Colombia, which has long been at the heart of the international drug trade, and because of the extensive connections between drugs and terrorism, improving counternarcotics cooperation with Venezuela is a small but important issue. The report primarily blames Venezuelan corruption for the drug trafficking, which combined with the reduced U.S. role has led to Venezuela becoming a major hub for narco-trafficking. Despite the cooling U.S.-Venezuelan relationship, the counternarcotics cooperation was strong between 2002 and 2005. But in July 2005 Chavez accused the DEA of spying and cooperation began falling apart. In September of that year, for the first time, the U.S. President designated Venezuela as failing to meet its counternarcotics obligations. The programs that have suffered are items such as intelligence gathering and sharing initiatives, logistical support for an elite task force of three-dozen Venezuelan prosecutors and investigators, and port and border control programs. Accurate measures of illicit activity like drug trafficking are not possible, but there is little question that that Venezuela has become a major transit point for drugs – particularly the burgeoning drug traffic heading towards Europe. The growth of Venezuela’s role in drug trafficking is very bad in its own right, but it has also thrown a lifeline to the FARC, which has been devastated by the Colombian military next door. Finally, illicit activity is a highway for terrorists and other trans-national malefactors. Improved U.S.-Venezuelan counternarcotics cooperation would be an important step to reducing some of these problems. President Obama has explicitly stated that he hopes to improve America’s image in the world and to that end he publicly shook hands with his predecessor’s hemispheric nemesis, Venezuela’s Hugo Chavez. Translating good feelings into pragmatic benefits is another matter entirely, but an excellent objective would be to restore – as much as possible – U.S.-Venezuelan counternarcotics cooperation. None of this is too ignore the multiple other issues in U.S.-Venezuelan relations, particularly the deteriorating human rights situation in Venezuela (although Chavez's bid for regional power may go into remission if oil prices remain relatively low), but counter-narcotics cooperation is a low-level security issue that can have big consequences. According to the GAO, Venezuelan officials would be interested in resuming cooperation with the United States, and on some issues cooperation has continued. However, persuading Chavez to sign on, when he derives so much benefit from bashing the U.S., will not be easy. Obviously the general improvement in international feelings towards the United States under President Obama is helpful – but it will not be enough. The U.S. can also approach European allies who have begun to suffer from increased drug trafficking originating in Venezuela. Spain, who’s prime minister has a friendly relationship with Chavez, would be a particularly useful go-between. A bit of public diplomacy would also be helpful. During Chavez’s presidency, Venezuela’s crime rate has skyrocketed. Chavez’s home province of Barinas has become the kidnapping capital of the hemisphere. Publicizing the American desire to cooperate with Venezuela against crime would force the issue on Chavez. The American pitch would have to be tailored just right – more in sadness than in anger. A humble America that recognizes its role in fueling narcotics trafficking around the world only seeks to aid the countries that suffer from it. This appeal would put the ball in Hugo’s court. Shouting matches only play to Chavez’s strengths as a charismatic speaker. A self-effacing approach might leave him speechless, and fill a real gap in hemispheric security. This year I am serving as program co-chair of Third International Conference on Computational Cultural Dynamics. We are currently accepting submissions and detailed information on the submission process can be found here. The conference will be held on December 7-8 and is sponsored by my employer, the University of Maryland's Laboratory for Computational Cultural Dynamics. Our goal is foster cross-disciplinary research that blend the social sciences with technological fields such as computer science. One of the primary areas of focus for our research has been counter-terror and counter-insurgency (I've been involved with efforts to model the behavior of several terrorist organizations), but the technology can also be applied to development and public health issues. Some background can be seen at the sites of the past conferences in 2007 and 2008.